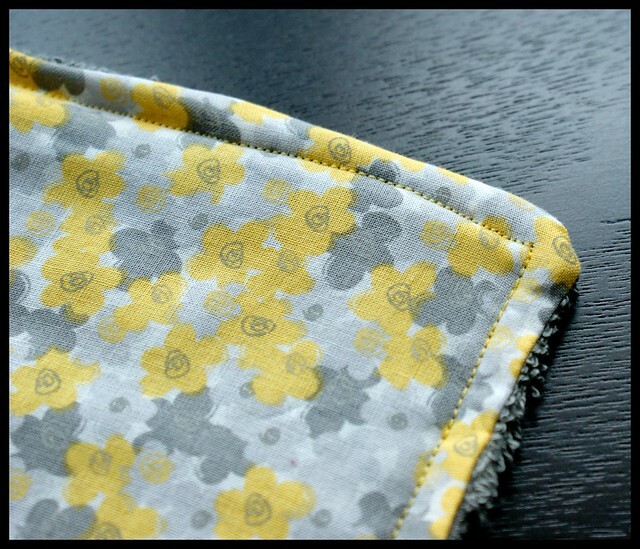 I recently borrowed a book from the library called ‘Simple Sewing with Lola Nova’ which has loads of useful projects that are quite different to the ones that get recycled over and over. The blog is also worth a read! It was one of these projects that got me thinking about giving the bathroom a little makeover. 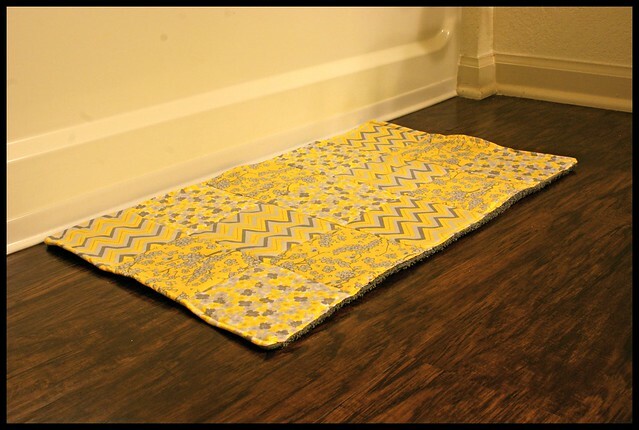 The bathmat project was simple but I did change a few things to suit what I needed. I bought a plain grey hand towel from Walmart that would be used as the back of the mat. 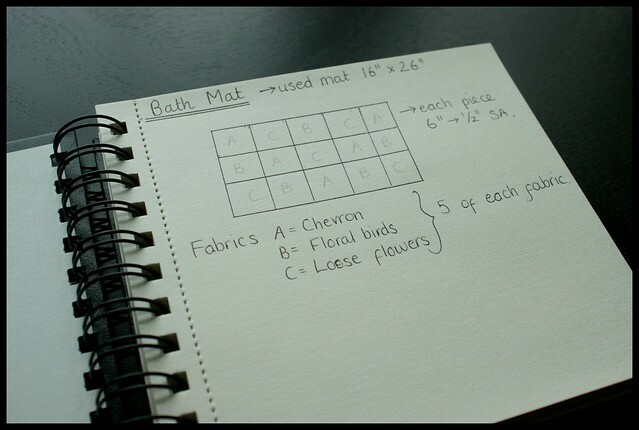 My plan needed to reflect the measurements of the towel so my patchwork squares were different to those in the book. 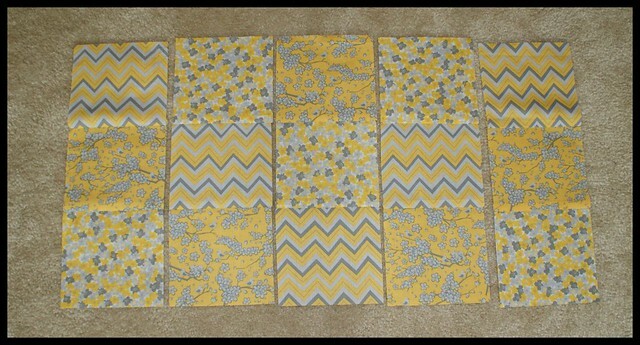 I pieced the squares together in columns and pressed the seams towards the top of the mat. I don’t think it really matters too much which way you press the seams; they just all need to be done the same way. 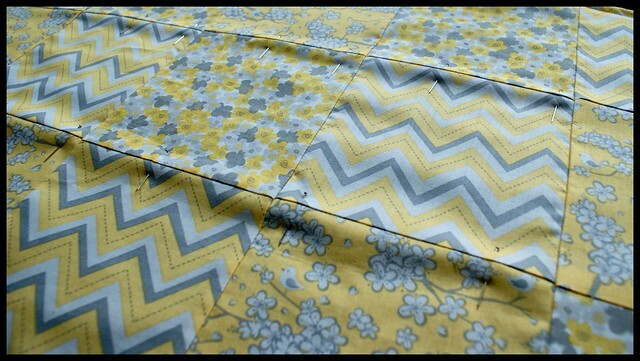 I then stitched the columns together to create the full patchwork front. I also used my little pinking shears to trim the seams…but I only did one set as I forgot to do the others before I stitched it together! With the right sides together, I stitched the seams to join the front and the towel. 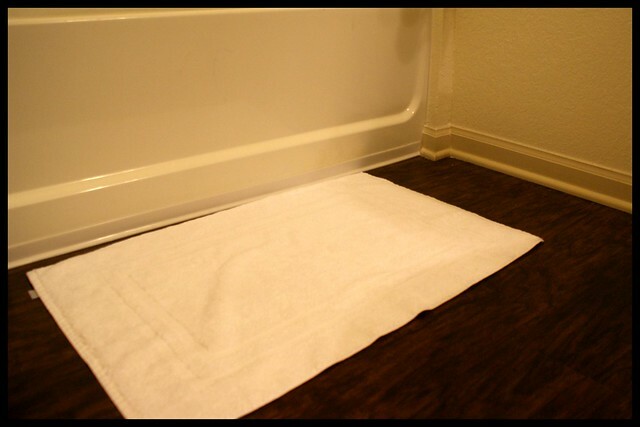 I needed to go quite slow on the corners of the mat as the towel was quite bulky. I left a gap so that I could to turn the mat the right way round. Once flattened out and formed, I topstitched around the edge of the mat, ensuring that I stitched the gap closed too. 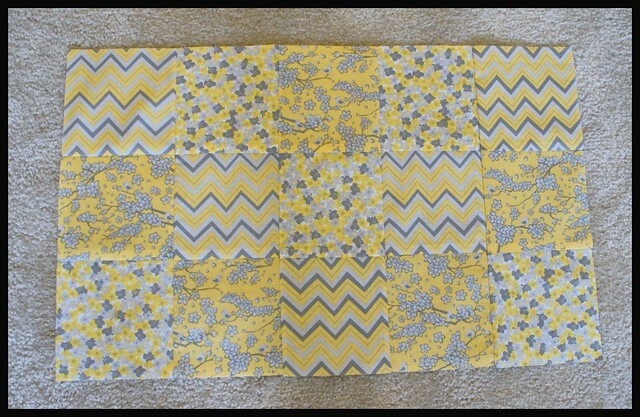 In the book, Lola binds the edges of her mat….but I hate bias tape so I wasn’t going to do that! 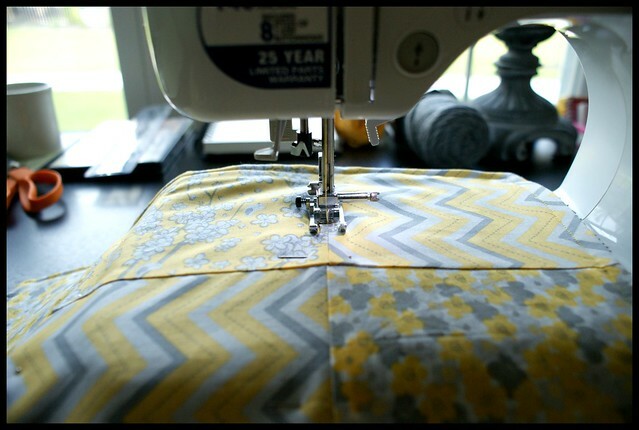 I placed pins along the main seams down the mat to hold it in place for when I was stitching. Once the mat felt secure, I stitched in the ‘ditch’ of all horizontal and vertical seams. This made a nice quilted effect on the front of the mat. Woohoo! Another pop of colour! I really liked the idea when I saw it 🙂 Might make a larger one next time; maybe cut a bath towel down to size! I would probably be one to cut up a big towel 🙂 I’ve seen them with towel edge, so just the pretty fabric in the middle, with a border of towel and towel backing too. Brilliant! And it matches your shelf covers if I’m not mistaken? Yes it does 🙂 I’m using some scraps up but my stash doesn’t seem to getting any smaller! 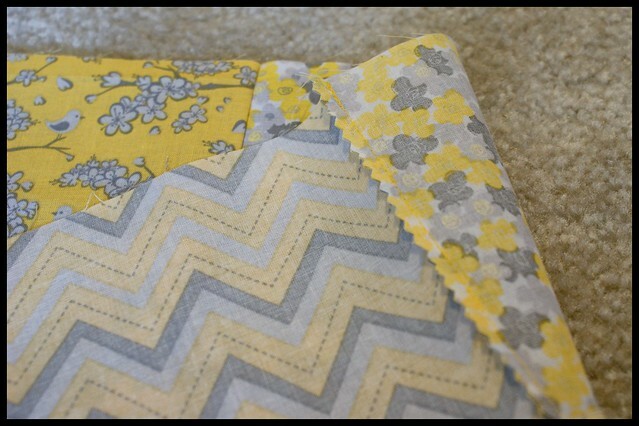 I love the yellow and grey color scheme you’re using! Thankyou 🙂 I like it too as it is one you don’t see that often!